Although there are a few different causes of snoring, the most common is the relaxation of the tongue and throat muscles, which causes the tongue to fall back and obstruct the airway. Breathing in this position causes the tissues to vibrate, making the snoring sound. The SnoreRX is a mandibular advancement device designed to pull the lower jaw, or mandible, slightly forward and hold it in that position so that the tongue cannot fall back into the airway. It is made of medical-grade plastics and is fully adjustable—from front to back—to accommodate different users with different types of bites. Once you get the bite adjusted, you put it in boiling water for a minute, place it in your mouth and bite down into the softened plastic. This makes a custom fit to your teeth to keep it in place overnight. It does take a few nights use to become accustomed to wearing the device and it may cause slightly sore jaw muscles for that time period. Customers report that it works very well and is comfortable to wear after the initial adjustment period, with the biggest complaints being a sore jaw during the adjustment phase and excessive salivation. One alternative to mandibular advancement devices is the The Good Morning Snore Solution. This tongue retainer does not pull the mandible forward, but instead repositions the tongue. You place this in your mouth in between your lips and teeth and create a vacuum by sucking the air out. You then place the tip of your tongue into the cup and the suction gently holds your tongue in place keeping it from falling back into the airway. There seems to be less of an adjustment period with this device compared with the mandibular advancement devices. 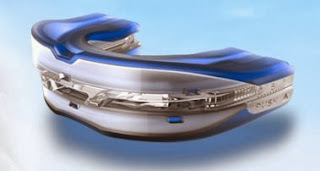 Users of the tongue retainer report about a seventy percent success rate with this device. Unlike a mandibular advancement device, this device can be used by denture wearers. Both devices are available at snoremart.com and are backed by a 30 day, 100% money back guarantee.